I had a really nice Ukrainian Christmas! The food all turned out fairly well (I was disappointed with the holubtsi but 1 out of 12 isn’t all that bad!) and there was MORE than enough food – infact we barely dented some of the dishes (and I had been worried there wouldn’t be enough…). People tried new foods and went back for second and third helpings!! 2. Holubtsi – cabbage rolls. I wasn’t totally pleased with the taste – I had tried using brown rice and I think they turned out really dry. I also think a smaller cabbage might have helped. 4. 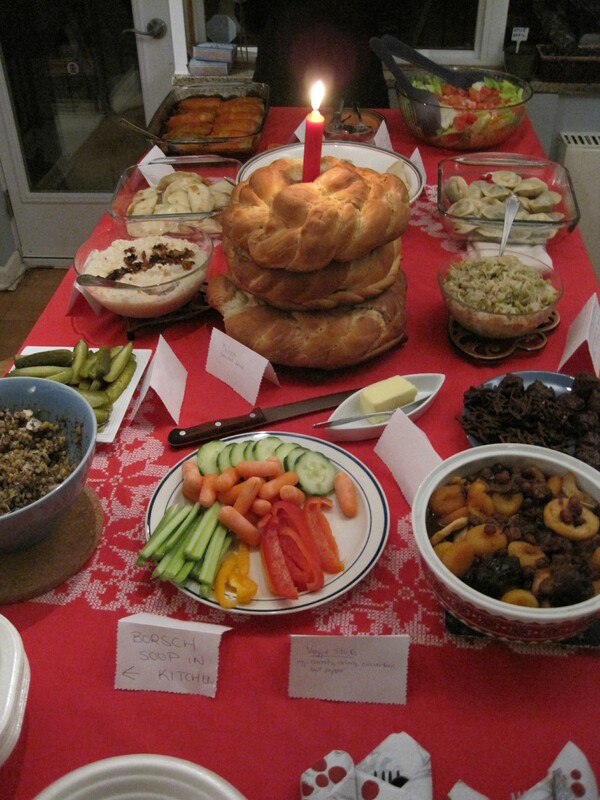 Kolach – 3 rings of braided bread stacked one on top of the other with a candle in the centre. Tons and tons of work (I sifted 27 cups of flour the night before dinner to make 3 rings for Friday and anothe 3 rings for Sunday) but I liked how they turned out. Need some tips on joining the rings and keeping them joined though – had some troubles while they were rising. 5. Kapusta with peas – sauerkraut with split-peas and garlic and onion. As I was making this dish my partner came in and said “I don’t usually like sauerkraut but that smells awesome” – always nice to hear! 6. Vegetarian Borsch soup – beet and cabbage soup with lots of other veggies. 7. White beans – mashed white beans with garlic and some fried onions on top. 10. Spicy Dill Pickles – homemade by my mom! To set the meal off perfectly, some of our guests arrived with Ukrainian beer in hand (many, many thanks)! This entry was posted on Saturday, January 8th, 2011 at 5:50 pm	and tagged with Christmas, Holiday, Pyrohy, Ukrainian and posted in Christmas, Ukrainian. You can follow any responses to this entry through the RSS 2.0 feed.